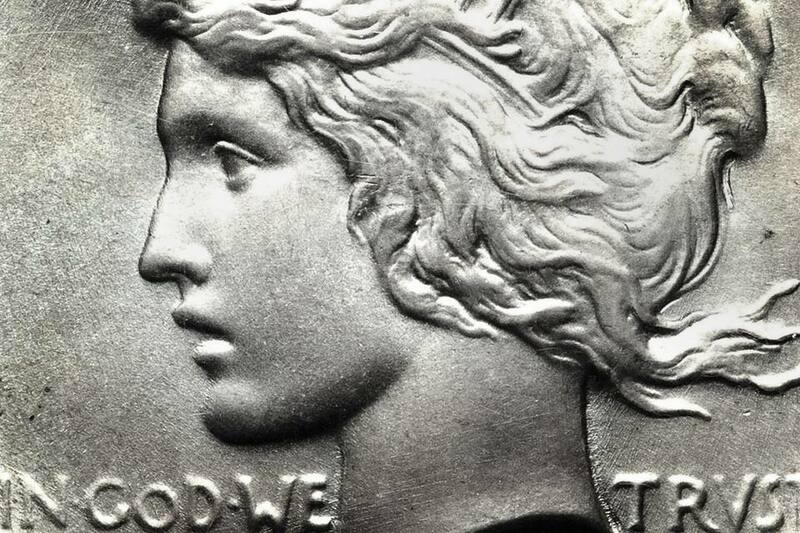 Knowing the Peace silver dollar key dates, rarities, and varieties will help you realize that slight variances on a coin can mean large differences in its value. You can learn to recognize these coins by studying the descriptions and photos of each type of coin. Many factors go into determining the value of a coin and this results in some of them being quite valuable. The rarer the coin is, the more valuable your Peace silver dollar will be. To comply with the Pittman Act of 1918, the U.S. Treasury Department authorized the striking of millions of silver dollars in 1921 using the old Morgan Dollar design. Artists at the United States Mint needed additional time to finish the design of the new Peace silver dollar. Sculptor Anthony de Francisci created the Peace silver dollar design in high relief. The new design caused the highest points of the design on the coin to be weak and lacking in detail. Between the Philadelphia, Denver and San Francisco Mint, a total of over 68 million Morgan silver dollars were struck in 1921 while only slightly more than one million Peace silver dollars of. In 1922, de Francisci lowered the relief to correct the problems with striking the coins properly. 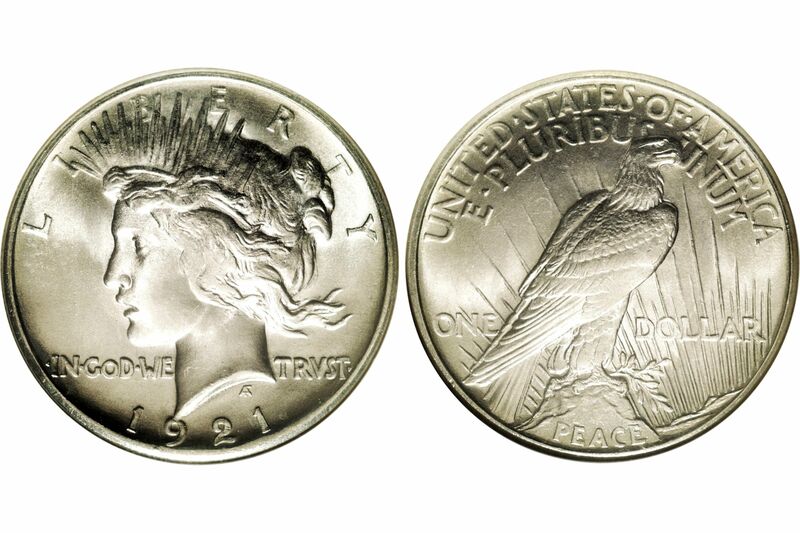 Therefore, the 1921 Peace silver dollar is a one-year design type coin. Coins are minted using a tremendous amount of pressure. The larger the coin is, the more pressure that must be used to strike it. Mint workers at the Philadelphia mint in 1922 failed to recognize a deteriorating die. The crack in the die on the reverse side resulted in a blob of metal below the eagle and above the word DOLLAR. This die variety is one of the Top 50 VAM varieties for Peace silver dollars and is cataloged as FS-S1-1922-001f. Once again, mint workers at the Philadelphia mint failed to realize a problem with a coin die. This time the obverse die was deteriorating and starting to crack. The crack started to appear on Lady Liberty's hair just behind her ear. You can recognize this die variety by a protrusion of metal that cuts across her ear and runs down to her neck. Coin collectors refer to this die variety as the "Ear Ring" variety. Numismatic researchers catalog this variety as VAM 2a (FS-S1-1922-002a) and is considered one of the Top 50 VAM's for Peace silver dollars. The 1928 Philadelphia minted Peace silver dollar has the lowest mintage in the entire series with only 360,649 pieces produced. With the Great Depression starting to take its toll on the United States economy, the demand for coinage by the American people began to drop. In fact, there are no Peace silver dollars minted between 1929 and 1933. Beware of altered coins that used a low-value 1928-S (San Francisco minted) with the "S" mint mark removed. If you want to add one of these coins to your collection, only authenticated examples from a third-party grading service should be purchased. The Mint did not produce Peace silver dollars since 1928, and pent-up demand pressured the mint into producing them once again. In 1934 the Denver Mint produced a run of doubled die obverse coins. Look for doubling on the upper left corner of the "D" in GOD and on the lower portion of the "W" in WE. Also look for doubling on the sun's rays on the right side of the coin and Lady Liberty's profile. The exact number of coins produced from this die is unknown, but collectors who specialize in collecting Peace silver dollars seek this die variety aggressively. Although readily available in circulated grades, finding an uncirculated specimen will be a challenge. With a mintage of slightly more than one million coins, this ranks the 1934-S Peace dollar as the fourth lowest mintage in the series. Since a low number of mint state coins were saved by collectors throughout the years, this resulted in a condition rarity. Beware of forgeries created by removing an "S" from another Peace dollar and adding it to a 1934 Philadelphia minted Peace dollar. Uncirculated specimens should be authenticated by a third party grading service before purchasing. How Much Is My Peace Silver Dollar (1921-1935) Worth? Do You Have a Valuable Lincoln Wheat Penny? How Much Is a Morgan Silver Dollar Worth?